While researching my family tree, I learned about Andrew Beaty — a forefather on my maternal side — and his involvement in the Battle of Kings Mountain. Beaty was one of the Overmountain Men who walked miles to engage the Loyalists in this epic battle. His story takes an odd turn because during the course of the battle he was bitten by a rattlesnake — although it is not recorded when he was injured, it is hard to imagine a person with enough grit and resilence to survive both the battle and a snake bite. But somehow he did. The battle itself was also unique for several reasons. The difference between a rifle and a musket is speed versus accuracy. A rifle is slow to load, but very accurate. Riflemen can hit a target at 200 or 300 yards. Yet the rifle can only be fired once a minute. A musket, with a smooth bore, is easy to load but inaccurate. Muskets have an accurate range of about 100 yards, but can be fired up to three times a minute. According to Andrew Beaty’s Revolutionary War pension application, Andrew served three stints with the Continental Line — each tour lasting three months. Although he was born in Pennsylvania, Andrew volunteered in Washington Co., Va., in the Spring of 1777 to serve under Capt. William Asher where the unit went to Little Station on Holston River as guards. Beaty re-entered the service in March 1779 as private under Capt. Abraham Bledsoe and Col. Shelby. In his last tour of duty (1780) he participated in one of the most important battles of the War. He again volunteered in Washington County — just a short time before the battle of King’s Mountain — serving under Capt. George Maxwell and Col Shelby. Their unit was one of several pursuing a group of Loyalists fighting under British Commander Patrick Ferguson. When the Patriots overtook the Loyalist, the battle was fought on an isolated ridge top in the Carolina backcountry. The sides were fairly even with about 1,000 soldiers each, but the manner in which they fought differed greatly. Initially the Loyalist had the advantage of higher ground and forced the Patriots to retreat down the mountain side by firing their muskets and charging with their bayonets. 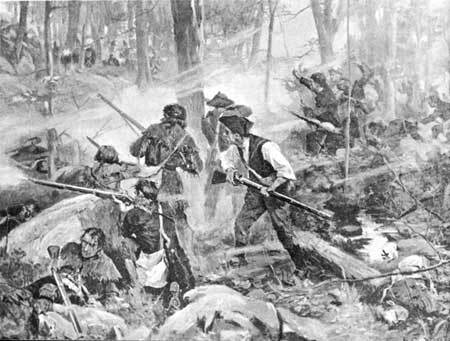 The Patriots, however fought back, eventually surrounding and overwhelming the American Loyalists by fighting frontier style — hiding in the trees and firing on the advancing Loyalist with deadly accuracy. Thomas Jefferson credited the victory as a significant turning point in the War for Independence.